Complying with the decisions of Congress, the U.S. Air Force has ceased work on the Defense Weather Satellite System that would have been the military's next-generation polar observatory program. Roots of the program stem date to the Clinton Administration's efforts in 1994 to merge the separate weather satellite projects operated independently by NOAA and the Defense Department into one program using shared spacecraft outfitted with advanced instruments. 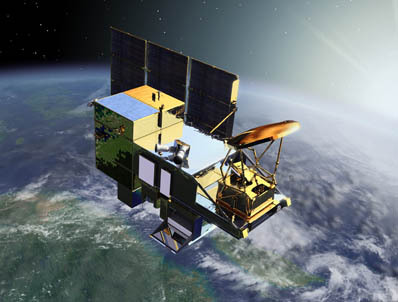 That National Polar-orbiting Operational Environmental Satellite System (NPOESS) was supposed to replace the civilian Polar Operational Environmental System (POES) and the Air Force's Defense Meteorological Satellite Program (DMSP). But NPOESS was besieged by an ineffective management structure, money woes and long delays, ultimately leading to the outright cancellation by the Obama Administration in 2010. The civil and military weather programs were instructed to go their separate ways in developing the next fleets of satellites. NOAA teamed with NASA to create the Joint Polar Satellite System and the Pentagon would create Defense Weather Satellite System. The civilian system launched a test-bed craft last October from California which was once envisioned as a pathfinder to prove the upgraded instruments for NPOESS. Now, the satellite is the gapfiller until the new NOAA birds get built and launched later this decade. Unlike NOAA that launches its final heritage POES satellite three years ago, the Air Force still has two fresh DMSP weather observatories waiting on the ground to be sent up as needed to replace aging craft in the years to come. The Fiscal Year 2012 National Defense Authorization Act and FY12 Consolidated Appropriations Act effectively cancelled DWSS, and now the Air Force has instructed prime contractor Northrop Grumman Aerospace Systems to halt work on the program. "Today the Air Force Defense Meteorological System Program constellation of satellites continues to provide high-quality and timely weather data to forecasters with two more satellites yet to be launched," the Space and Missile Systems Center said in a statement. It remains to be seen what future program will be developed to replace the DMSP constellation when those remaining satellites expire. The military weather birds orbit 463 nautical miles above the planet to survey the entire globe and help plan air, sea and land operations by military forces deployed around the world. The Air Force has been operating weather satellites for decades. Rejuvenating the constellation with new observatories ensures the continued flow of data for long-term forecasting and real-time inputs to leaders on the battlefield.